Is it weird that I definitely have a favorite battery brand? Although I'll buy other brands if needed, I have to admit that I love Energizer batteries! In my experience, they perform the best compared to all the other brands I've tried. 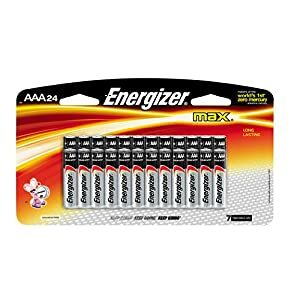 Right now you can get a sweet deal on a big pack of Energizer Max AA batteries. Buy a 16-pack of Energizer AA batteries with Subscribe and Save and you'll get them shipped to you for just $6.59! Amazon offers free shipping with no minimum when orders are placed with Subscribe & Save. Remember, you're under NO obligation when you place your order with the S&S option. Just go into your Amazon account and cancel your subscription after your order ships if you wish to avoid future shipments.